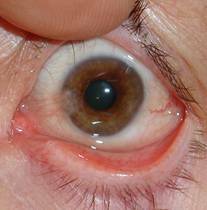 It is a benign proliferative disease in which conjunctival tissue invades the cornea (the conjunctiva is a transparent layer with vessels appearing on the ocular surface, except in the cornea). There are other processes that are similar to it but must be differentiated, such as corneal metaplasia, a process in which the cornea acquires vessels similar to those of the conjunctiva. 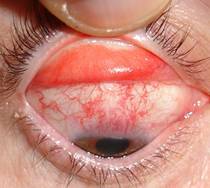 There is a disease called superior limbic keratoconjunctivitis in which conjunctival vessels can penetrate the cornea in a process different from pterygium. 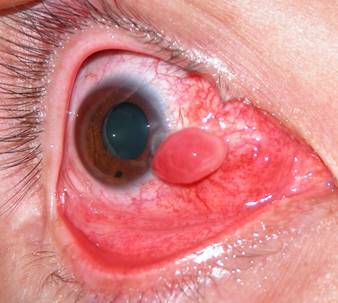 Also some patients and contact lens wearers may have vessels which penetrate the cornea which is called pannus. The biggest problem it poses is recurrence (return) after surgery, which in some cases exceeds 50%. There are genetic and familial causes. Also important is exposure to solar radiation. Common in Andean countries, due to radiation and altitude. There are other causes such as trauma, burns, aging, etc. It appears more frequently in the nasal area and the equatorial meridian (the most exposed to atmospheric phenomena), but may also appear on the temporal side and even in other meridians. In young patients especially those from equatorial countries, it can be very aggressive with extensions and anchors to the underlying muscles especially in patients who have undergone multiple surgeries. 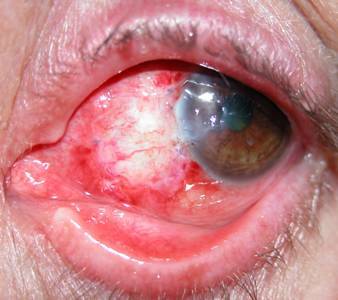 Pingueculae may predispose to the development of pterygium. The use of continuous rubbing lenses in patients with pingueculae, could theoretically produce enough damage to develop conjunctival alteration. 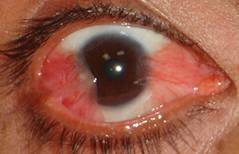 The main symptom is the red eyes from their vessel engorgement and irritation in subsequently active pterygia. They can alter the conjunctival fornices with shortening. 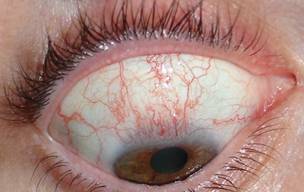 More rarely, especially after multiple surgeries, complications involving extraocular muscles. There is an aesthetic conditioning that makes patients want surgery. In principle nonactive pterygium need not be operated unless invade pupillary axis. Treatment is surgical. So far there is no effective technique to ensure the absence of recurrence. So our efforts are aimed to reduce the chances of this event as much as possible. For this purpose new techniques and materials have been designed. 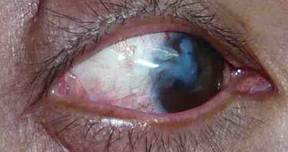 When should pterygium be operated? 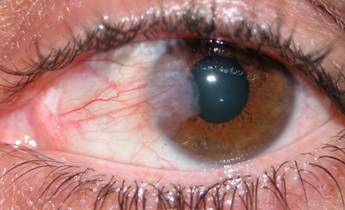 If the pterygium penetrates the cornea significantly more than 2 mm. Surgery is performed under conjunctival anesthesia and is not usually painful. The simplest technique is excision of the lesion and closure of the edge of the conjunctiva with a very fine suture. It is performed in patients without risk factors (activity, red-glasses very young, or patients from Latin American or ecuatorial countries, which have a high rate of recurrence). Implantation of amniotic membrane: it is implanted in the area where excision is practiced, a membrane layer from the donor amnion. Conjunctival autograft: is the best choice being a tissue of the same patient that is removed from the top and is implanted in the bed from which the pterygium was extracted. This graft can be fixed with Tissucol biological glue or stitches. Currently use of Tissucol is faster and more efficient although it is a more expensive procedure. Other options such as radiotherapy have currently been abandoned. The procedure usually lasts about 20-30 minutes. The patient needed postoperative care based on the application of antibiotic and steroid eye drops for a period of 3-4 weeks. 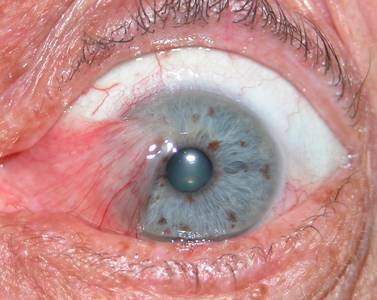 They should be warned of the possibility of recurrence and complications such as granulomas and cysts of Tenon and presentation of red eye that can sometimes last for several months. 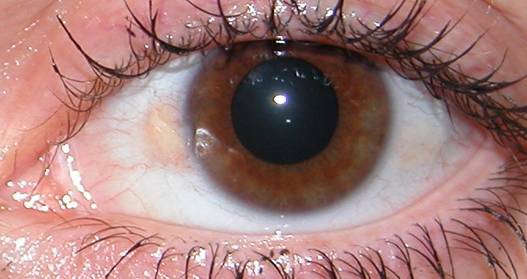 It is a yellowish-white lesion appearing underneath the conjunctiva to the corneal side of its equatorial meridian, more frequent in the nasal side. 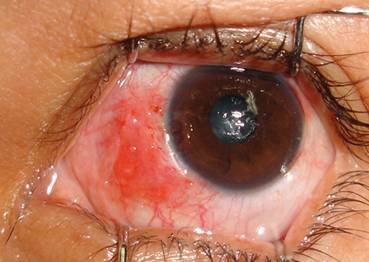 Unlike pterygium, it does not invade the cornea, but may predispose to development of this condition. It is a benign lesion. The causes are irritants, exposure to sunlight or hereditary. It usually causes no symptoms in general. Occasionally it may ignite and produce red eye. It may cause cosmetic alteration, which in some patients may require surgery. A pinguecula usually does not require surgery. Exceptions are made in cases of inflammation, repeated clinically evident episodes or growth. Treatment for swelling is the application of anti-inflammatory eye drops.